1.7"/second up to 180 lbs. 1.4"/second up to 360 lbs. At the time of writing, it only has a simple 2-button up/down controller. High pressure laminate quick-ship top is not impervious to moisture damage. Although we did not get to test the Uprise in our labs, we’re familiar with its TiMotion base and conventional HPL tabletops. The Uprise is a solid contender among the low- to mid-price sit-to-stand desk choices now on the market. Its TiMotion base is sturdy and quiet, and a more stable and reliable choice as compared to other Chinese-made electric bases we’ve reviewed. The range of desktop choices can accommodate almost any office budget and décor, though you’ll pay a premium for the nicest-looking bamboo and hardwood desktops. 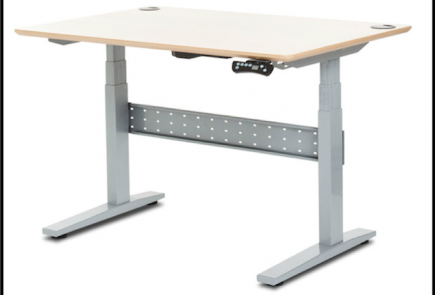 Its solid warranty and progressive shipping policies make it a good choice if you’re looking for a budget to mid-range height-adjustable desk. Its table top lacks the superior lamination technique of 3D lamination, but it’s still a smart buy for anyone shopping for a lower-cost electric desk. Ergoprise’s Uprise Stand Up Desk is a solid, mid-tier desk that stands at the crossroads of function and affordability. Its base is quiet, stable, and strong, and it comes with different desk top options that range from the economical to the premium, depending on the user’s taste and office requirements. It’s the spiritual successor to Ergoprise’s original adjustable height desk, the S2S, which used a lighter, less stable desk base. With the Uprise, Ergoprise has separated itself from the millieu of vendors who still use a very common but lesser-quality Chinese-made base and veered off to join a smaller flock of manufacturers who’ve chosen to spend slightly more money on much better base components (still Chinese-made, but of higher quality). One of the most seasoned sellers in the market, Ergoprise has earned their experience through selling thousands of earlier-generation desks, and now they have parlayed their extensive product knowledge into their new Uprise. One thing we at really like about Ergoprise—and it shows in their choice of a more stable base platform—is that they also have more experience with treadmill desk users than most other manufacturers. Others tend to focus more narrowly on sitting to standing alone, where stability is still important but not as critical as when you’re moving at 1 – 2 mph. For many people, a significant barrier to getting a new desk is price: No matter how you slice it, a good stand up desk is still a piece of furniture and a hefty investment (though not all expensive desks are necessarily of good quality). Budget-class desks like the Autonomous SmartDesk 2 and the StandDesk Pro have emerged that are priced below the more feature-heavy American-made standing desks and even “premium” Chinese-made desks like the Jarvis and UpLiftDesk that are built on the commodity-quality Jiecang base. They usually have shorter warranties as well, being made from cheaper materials in China. And usually, they have lower performance scores and capacities—though that too isn’t always a surefire correlation between performance and price. In any event, these low-cost desks have met with varying success. The Uprise Stand Up Desk is built on the TiMotion’s medium-tier base. Taiwan-based TiMotion also makes high-end bases with 490-lb lift capacity, such as those used in iMovR’s Synapse conference tables and their Vigor standing desk frame for DIY builders. TiMotion’s medium-tier and high-end bases are sturdier than most desks bases made in China, even at its maximum height extension. Part of this can be attributed to the sheer weight of the desk: While other mid-tier desks use lightweight bases of 60 – 70 lbs., the TiMotion weighs in at a hefty 93 lbs., plenty of weight to anchor your desk in place. Note that TiMotion also makes low-cost, low-quality bases in their Chinese factory for companies like Autonomous, so not all TiMotion bases are created equal. Stability is also bolstered by the desk’s particularly tall max height of 51 inches, which allows for more overlap between the telescoping leg segments, and less shakiness all around. The TiMotion base is not only heavy, it’s a heavy lifter. The medium-tier TiMotion base used in the Uprise desk can lift up to 360 pounds without breaking a sweat. Most users would be hard-pressed to find 360 lbs. 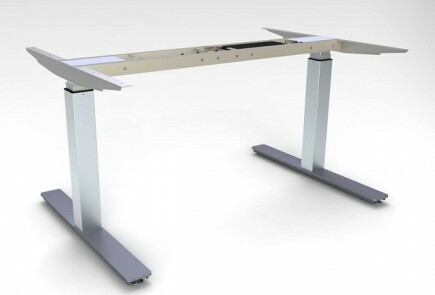 worth of computers, mice, and keyboards, but a stand up desk’s weight capacity is nevertheless an important indicator for the durability and quality of its motors and actuators. Take the Ikea Bekant, which claims to have a 150 lb. weight capacity. This seemingly high stat belies the poor quality of its motors: Users have already begun to report on their Bekants failing in the field. Consequently even on ikea.com the product garners a 1.8-star rating from customers. The TiMotion’s heavy-duty weight rating reflects a sharp contrast in its reliability and durability as compared to the cheapies. This sturdy base also makes it suitable for use with an office treadmill. Stability (shakiness) is a paramount criterion for standing desks in general, and for treadmill desk applications especially—not only because the sway of the user’s body induces oscillations into the desk, but also because adding an extra 5”- 6” of deck height under the feet means the telescoping leg segments of the desk base have that much less overlap between them. That means that the higher your work surface, the more unstable your desk becomes. Generally speaking, any user over 5’9” tall should be concerned with stability, whether or not they use an under-desk treadmill. 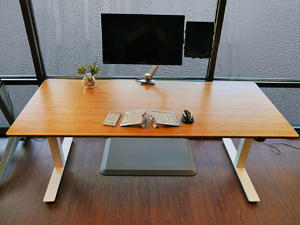 The Uprise desk’s 51″ max height maintains more leg segment overlap at taller heights. The Uprise is available with a bevy of configurable options. Available desktops include both the standard fare of high-pressure laminate (HPL) tops, as well as higher-priced premium tops. The HPL tops come in 11 wood grain and 6 solid color laminates and feature a PVC edge banding that is available in 15 color choices (which may not always match the color and pattern of the desktop itself). HPL is a solidly mediocre desktop material due to those vinyl or PVC edges, which are susceptible to moisture damage and can peel away over time. Ergoprise also offers an Electro-Static Dissipative (ESD) desk top, perfect for electronics assembly and other workplaces where static electricity could be problematic, and a chemical-resistant Phenolic top that won’t be damaged by strong disinfectants. 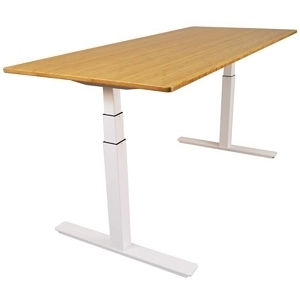 These alternative table tops have different color options from standard-top Uprise desks. Customers willing to spend a little more can opt for a premium bamboo or hardwood top, which raises the price above that of a typical mid-tier sit-stand desk. A 30”x48” bamboo-topped Uprise, for example, costs $1,595. 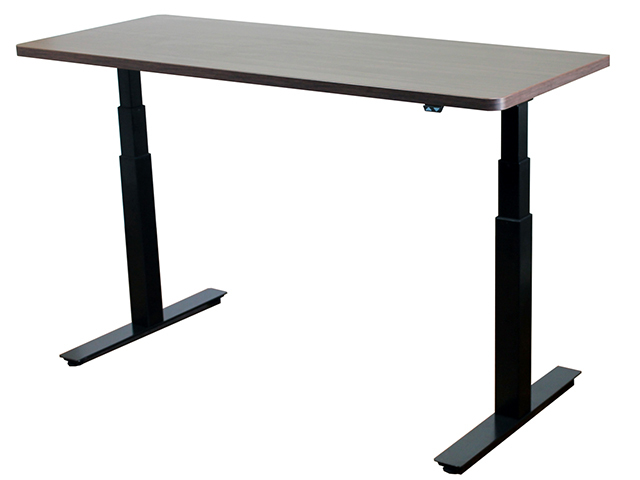 It’s a hefty uptick in price, but if you’re considering an UpLift desk or Fully desk for its bamboo top then you should definitely consider this product for its higher-quality base. That being said, don’t fall for marketing claims that emphasize bamboo’s positive environmental effect. The Uprise’s tops come in the typical variety of widths: 48”, 60”, and 72” widths, and notably 24”, 30”, and 36” depths. Note that the desk base is not really designed for 24” deep tabletops, so the feet will stick out beyond the tabletop both in front of and in back of the desk. That may be fine in open areas but if you put a 24”-deep desktop on this base and put it against the wall there will be a gap between the desktop and the wall, allowing your desk objects to freely “base jump” to the floor (forgive the pun). In addition to these table top options, users can choose to upgrade the Uprise’s standard up/down controller to an LED Controller with programmable height presets. 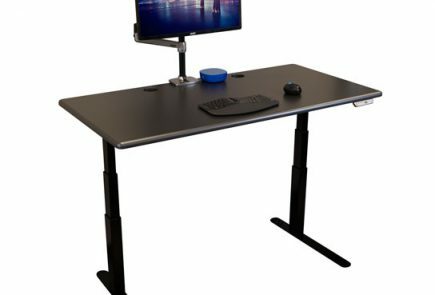 Advanced desk controllers allow you to set different heights for sitting, standing, and walking modalities, and are an immense convenience during your workday. 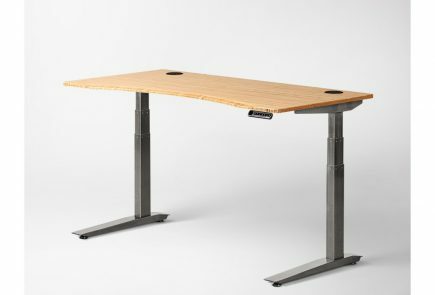 How Does the Uprise Stand Up Desk Compare to Other Mid-Tier Desks? From our perspective from having tested so many sit-stand desks that are on the market today, there are “cheap” Chinese-made desks and there are higher-quality Asian-made desks, as well as the top-quality American-made standing desks. The Uprise is an example of the higher-quality Asian imports. 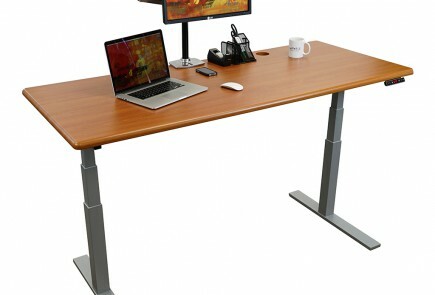 Other desks that are only slightly less expensive use inferior base components, which account for the difference you’ll see in our review ratings when comparing products based on Jiecang or Conset bases, e.g., versus TiMotion and other brands we’ve come to know and appreciate for their quality. The Jiecang base’s quality issues impact not only its reliability and durability, but its performance and stability as well. Some other mid-tier standing desks like the all-American iMovR Energize offer an alternative to the Uprise’s High-Pressure Laminate (HPL) tabletop surfaces: 3D lamination. 3D lamination is a newer, more advanced tabletop manufacturing process that results in a more durable and stable surface, ergo-contoured edging, impressive fully-laminated grommet holes, and an elegant appearance of being made from a solid piece of hardwood. 3D lamination costs less than the commonly-used HPL that’s been used for decades, but requires very expensive and very large machinery to fabricate, which few tabletop manufacturers yet possess. That being said, if you’re looking for premium bamboo or other hardwood tops, or you need an extra-deep 36” desktop, you won’t find them at iMovR. The Uprise is backed by a solid warranty: 5 years on the electronics and moving parts and a lifetime warranty on the steel and table top. It ships out 2-3 weeks from the time of order via freight carrier. 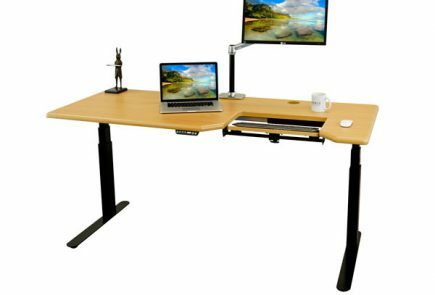 To view more adjustable height desks, visit our Adjustable Height Desks Comparison Review. Be sure to sign up for our monthly newsletter to get the latest in ergonomic- and active workplace product reviews.